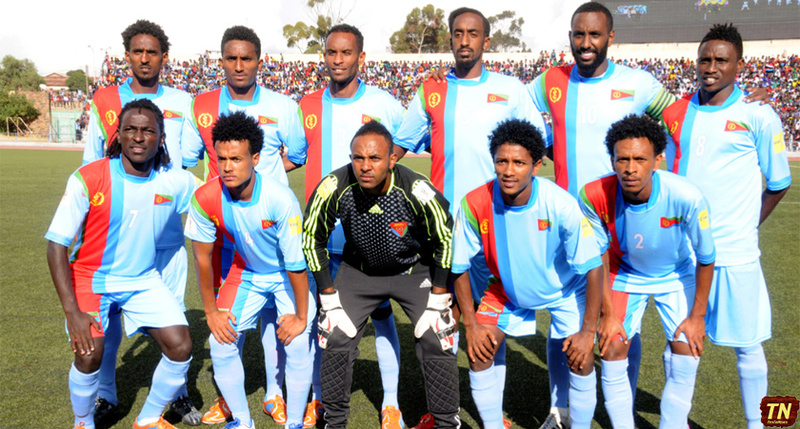 The newly re-organized and restructured Eritrean National Football team in their first leg match with Botswana in Asmara. The Red Sea Camels failed to advance to the next round of FIFA World Cup 2018 Russia Qualifying matches after losing 3-1 to the Zebras of Botswana in Francistown yesterday. Henok Goitom scored on a brilliant header off a cross pass he received from Yonas Solomon only nine minutes into the game. With the goal he scored in Francistown against Botswana, Henok Goitom becomes the latest football star to score a goal for two different countries in international matches. Henok had previously scored four goals in thirteen appearances for the Swedish U21 team. Henok’s goal was likely one of the few bright spots for the Camels yesterday as they gave up three goals in losing the match. The Camels’ offense finally put a coordinated attack as Henok was able to score on a lethal cross pass he received inside the box. Indeed, his entire football career suggests that Henok is a potent finisher from inside the box at the forward position. Camels’ fans fervently hope that Henok will continue his involvement in the development of Eritrea’s National Soccer Team. Botswana — the beautiful land known for its Kalahari Desert, lush animal habitats, safari camps, crocodiles and hippos — now plays Mali in the next round of the FIFA qualifying match. The team captained by Joel Mogorosi and coached by Peter Butler has shown that it has what it takes to go deep into the FIFA qualifying matches and possibly hold its own against African powerhouses like Cameroon, Nigeria, Senegal and Ghana. As for Eritrea’s national team, it has a lot of rebuilding to do before it can be considered a threat to any team outside of the hapless East Africa. Soccer is too important and too popular of a game worldwide for Eritrea to continue to languish in the backwaters of East Africa’s inept teams. Just as our cyclists and runners have shown us, sports is a great way for a country to build a positive image for itself internationally and a fan base for its citizens. If the rebuilding is done right, Eritrea will show the fruits of its rebuild in a short time. For starter, the Football Federation of Eritrea needs to hire a coach who has played in the top echelons of European leagues. It can afford it. The Zebras coach, for instance, played in the Premier League and only makes about $10,000 a month for his services. This is not meant as a slight to the current coaches of the Camels because they are doing a tremendous job trying to build a team from scratch, but soccer has evolved a great deal in the last 20 years and you need someone who has played the game at its highest levels to teach and develop your young talent. Secondly, the recruitment of foreign-based players needs to continue. Most Camels’ fans will have no problem seeing the team stocked with foreign-trained Euro-Eritreans like Henok Goitom and Senay Berhane, especially since the domestic talent seems to fall prey to human traffickers. Thirdly, the Camels needs to practice together more often to build team chemistry. There is no reason why Eritrea can’t hold a training camp for its national team in European cities during the off-season so that distance is not an issue. And then fly them in to Africa or the Middle East a few times a year for friendly matches against other than national teams. This is not as difficult as it sounds. The talent is already there. It just needs to be organized and molded.